Wow, your card is so precious. I love the shape of it and the stitching around it as well. The waves look so great & that little sailboat just floats atop them perfectly. I adore the bow on the top & the embossed background. Angelo is really going to love this. Oh, Roberta, what a darling, darling card! It's beautiful!!! I am so touched! 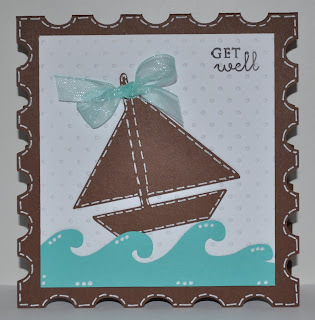 Angelo's bedroom has a nautical theme and as soon as I saw your card, I pictured it in his room! I love the postage stamp shape and the creative hand doodling. Thank you so, so much for making this special card for my special little grandson! It really means the world to us! This is beautfiul! I love the colors and embossing. Your pen work is fabulous! What a gorgeous little card!! How nice that it matches his room too! Such a super cute card Roberta! I know Angelo will LOVE this! I really love the postage stamp shape and the colors all work so very well together! Perfect for brightening up a precious little boy's face! Oh Roberta, This is just so beautiful. All little boys love sailboats and I just know Angelo will absolutely love this one. I love the way you added the stitching and accents with the pen. It just brings it alive! I also want to apologize for not having my post up this morning. I have been traveling today and couldn't get on the internet. Finally late in the day I wa able to post. I don't want to let you all down. Your card is just too beautiful! I love the colors and the sailboat! Perfect for a boy! The shape and your doodling is also perfect! Great job.. as always! Great card,love the colours and doodling. Roberta what a great card! I absolutely love it!